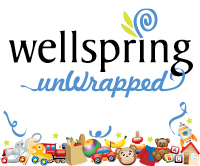 Wellspring Family Services is coming UnWrapped Saturday, Dec 4. Help homeless kids this holiday season by joining Wellspring's Holiday Open House with a special performance by Caspar Babypants and other kid musicians. Free for all ages, but please bring a new, unWrapped toy to donate to a homeless child for the holidays. We're thrilled to be opening our doors for our annual Holiday Open House event. Come see what's happening inside of our new facility at 1900 Rainier Avenue S (just south of the I-90 overpass). We'll have fun for the whole family including live music, crafts, free family portraits, festive food and drinks, tours and more. We'll have Live Entertainment All Day! Starting at Noon ~ Caspian Coberly, age 10, has been obsessed with the electric guitar since before he could speak. He has been studying guitar for 5 years and performing for the last 4. The first song he ever played live was Smells like Teen Spirit by Nirvana which he also sang. In the past year and a half Caspian has played at the Key Arena 4 times and the Comcast Arena twice. He likes all types of music, from heavy metal to funk and is very excited to open for Caspar! 12:15 PM ~ Caspar Babypants makes simple upbeat acoustic sing along music for babies brains and parents ears. Caspar Babypants is also known as Chris Ballew, Grammy nominated lead singer of the rock and roll band The Presidents of the United States of America. CASPAR says: "I want to make music for the very young because I admire their associative inventive imaginations and as an adult I nurture that same creativity in myself. * Caspar's debuting a new song written about the winner of this summer's Kids Helping Kids contest. Don't miss Caspar Babypants Live! 1:00 PM ~ Richard Carter has just started his 3rd year of private piano instruction at Shoreline Community College and is on his way to fulfilling his dreams of earning his Bachelors and Masters of Music Education Degrees. He can play a wide range of piano music from Baroque to pop and delighted our Luncheon guests in April. Richard has a special connection to Wellspring. For a while, he and his family were homeless, living in tents and a Winnebago. Eventually, they found Wellspring and were moved into transitional housing. It was during this time that Richard began taking piano classes at Shoreline. This is a free event open to everyone in our community, however we do encourage you to bring a new, unwrapped toy to donate to our Holiday Toy Room. Our Toy Room is a special place where homeless families come and choose gifts to share with their children. Staff, volunteers and donation drives throughout the community make our toy room possible. We expect to share gifts with 1,000 children this holiday season. If you don't have time to shop, gift cards and financial donations are greatly appreciated.